While population-based research has linked intake of red meat with certain forms of cancer, the exact linkage is still not clear. Past investigations have queried saturated fat, carcinogens resulting from cooking, bacterial endotoxins and the high content of heme iron – all without a conclusive answer. Currently, scientific controversies over the health effects of saturated fat has lead some in the community to once again embrace red meat as a healthy choice so understanding the health outcomes of this choice is very important. 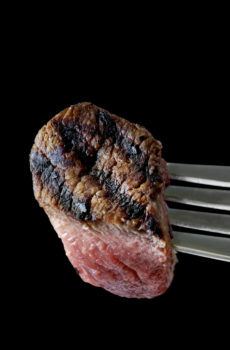 This latest study renews concerns over red meat intake, via a biological sugar, known as Neu5Gc. What is interesting about Neu5Gc is that it is widely found in mammals and is present in human tissues, even though we cannot produce it – meaning that its origin must be dietary. Theoretically, as a foreign molecule, Neu5Gc could cause the human immune system to form antibodies and promote chronic inflammation; inflammation is known to enhance cancer progression. This study, performed in rats bred to be free of Neu5Gc, found that to be the case. In this study, rats fed red meat had elevated markers of chronic inflammation and a five-fold increase in tumour growth. However, extrapolating these results to humans will be much more difficult as there are many questions yet to be answered: how does our own immune system respond? Is there a genetic variation in response? Are their other dietary factors that enhance or combat this response? Are all food sources of Neu5Gc equal? At the end of the day, what can be learned from this study is that red meat is unlikely to be a food to eat with abandon. If you are inclined, cut it out in favour of poultry, seafood and plant proteins – which is a solid nutritional prescription to reduce chronic disease risk. If you love red meat, eat it as an occasional treat and ensure your diet is rich in anti-inflammatory foods such as fruits, vegetables and legumes. The original research review was published in PNAS. Link to abstract: A red meat-derived glycan promotes inflammation and cancer progression.